officially ate all the pies!" Welcome to INTO THE STORM! I hope you like the new graphics and the new address www.intothestorm.co.uk should be easier to remember! 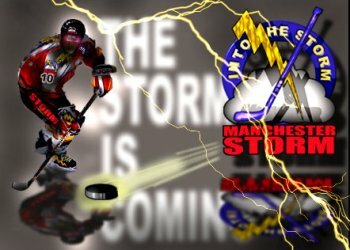 Into The Storm is one of Manchester Storm's unofficial Web sites. It is brought to you by Manchester Storm fans for fans of Manchester Storm and other fans of UK ice hockey. This site has no connection whatsoever with Ogdens Entertainments Ltd or the Nynex Arena. Into The Storm is the VOICE of the FANS of Manchester Storm. To read all about the people who made this Web site possible, see About Into The Storm. You can navigate Into The Storm from here by selecting one of the pages below. Click on the ITS logo in the left frame at any time to return to this page. If you haven't seen the Bud Ice screensaver yet, then you can download it by clicking here. The file is 1.7MB in size so it could take a while to download with a modem link. The screensaver features a pengiun as a netminder and you can take slapshots at him. Visit the MANCHESTER STORM MESSAGE FORUM and air your views on Storm! You can register for STORM BLITZ a free news by e-mail service. Want top flight Storm humour? There's only one option - MISCONDUCT!